UK paint and chemicals giant ICI has rejected a £7.2bn bid approach from its Dutch rival, Akzo Nobel. 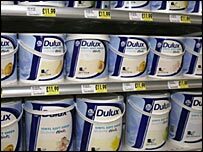 Dulux maker ICI said that the 600 pence-per-share offer from Akzo, producer of Crown Paint, was too low. Akzo said that there was no guarantee of a higher offer for the UK firm, but the prospect of an increased bid sent ICI shares up by more than 15%. "Akzo Nobel will continue to evaluate all strategic opportunities, including ICI," the Dutch firm said. It added that a merger would "represent a highly attractive addition to its focused coatings and chemicals business". Shares in ICI jumped 15.5% to close at 634.5p in London trading. ICI, which was established in 1926 and employs around 4,000 people in the UK, said it was "very confident in the group's strategy and strong growth prospects," the chemicals giant said. Shares in ICI have soared over the past year on rife speculation that it would be a takeover target, particularly after last year's disposal of its flavours and fragrance operation Quest. Other possible suitors include US firm Dow Chemicals and India's Reliance Industries, according to analysts, who say that an offer of 650p a share would be more acceptable to ICI. At its peak, the firm was an industrial powerhouse in the UK with interests in pharmaceuticals, food additives and dyes, but since the 1990s it has suffered cost pressures and struggled to refocus the business on paints and specialty chemicals.